Our luminous “Alone and Together” issue is now appearing everywhere like a beautiful new spring bird. And not surprisingly, I have been reflecting about the connection between solitude and community. At times, it feels like THE theme—the very key to life. There is a fascinating article in the issue, on the poet Rilke, who longed for solitude so he could draw close to the source of things. Exhausted from my editorial labors, I streamed “Merton: A Film Biography,” the other evening. I was struck by scenes that depicted how communal the life is in the Trappist monastery Gethsemani. Young Thomas Merton entered the monastery seeking a place apart “to entertain silence in the heart and listen for the voice of God – to pray for (my) own discovery.” And yet for years, he was rarely alone. In pictures from his ordination, Merton glows with youth and happiness–in spite of an extremely Spartan life and striking lack of privacy. The monks sleep in little cubicles and otherwise seem to do everything collectively and under the watch of the abbott. And this seems to be the source of the freedom and simplicity and radiates from Merton. In the community of the monastery, he sheds a skin of separation. It reminded me of what can happen briefly on retreat. There is a wearing down of the ego and its relentless insistence on making us special (if only by being especially bad at kitchen work). There comes a point when we let go of the story of ourselves, when we let go of our fear of what others think and of being no one and all the rest. Seeking solitude, we find ourselves in community. Letting go of ourselves, we may find our way to deeper feeling of connection with life. 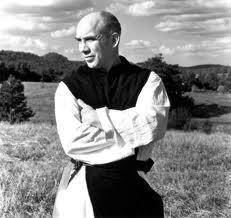 Living apart from ordinary society as a monk, Merton found his way to the heart of life. In bustling downtown Louisviille, Kentucky, Merton had an epiphany. He saw himself in every passing stranger’s face. He was not separate from them, nor they from him. Merton went on seeking solitude. He was the first Trappist monk to be given permission to live in a little hermitage, away from the communal life of his brothers. And yet from that place of solitude, Merton reflected and wrote on the burning issues of the day. He travelled the world from that place, and he never lost that recognition of our common humanity. There is a stillness under the noise of the world and our own thoughts. There is a kind of solitude that not a flight from others but a way of being with ourselves—the whole of our experience, excluding nothing. How precious it is in this pressured age to unplug and drop out and tune in to the experience of being fully present for a time—if only for the space of a prayer or a meditation or a walk. Retreating for a time, we may find our way home to our humanity. Seemingly worldly people can harbor a secret monasticism. In Merton’s case, certainly being a writer is a monastic calling—even his famous excess, the girls and parties and time spent in the bars around Columbia University were ways of sending up flares: find me, God. And most adolescents are seekers. Most hide pure hearts under what they hope are tough and worldly exteriors. Most are seeking a way to be alone among others. Last time, I alluded to a high school boyfriend who liked to dress in black and act all dark and mysterious. There was actually a group of us who tried to give off a whiff of outlaw or underground—who tried to be psychedelic seekers. We would gather often in the attic room of a boy who liked to call himself “Shiva Gonzo” (which gives you some indication of his major influences). We would sit there by the light of candles shaped like dripping skulls, listening to Led Zepplin and Spirit and similar music, trying to find our way to the source. A dozen years ago, I interviewed Ram Dass for a magazine. We warmed to each other and wound up spending hours laughing and talking. I told him I felt I had bonded with him—specifically with his book Be Here Now– years before. I described being in an attic room in a house in Northern New York with a crowd of psychedelic seekers that included a boy named Shiva Gonzo. But all the while, I felt a connection to his purifying pilgrimage to India and his meeting with the extraordinary guru who saw through his social exterior—who showed him his true self. “If I had a nickel for everyone who has said that to me,” Ram Dass laughed, banging his hand on the arm of his wheel chair (a little more on this encounter to come). Hi, paragraph 6: “Last time, I alluded to a high school boyfriend who like to dress in black and act all dark and mysterious” — “like” should be “liked”? As you probably know the two that have had the greatest influence on me concerning society and solitude (alone with others) are Gurdjieff and Simone Weil. they have helped me to appreciate the Christian concept of being in the world but not of it. I know it isn’t a popular or politically correct concept but I have come to believe that society itself is the Great Beast spoken of in Revelations and by Plato as well as Simone Weil. it is a harsh concept but if Gurdjieff is right and we are as described in the Armenian tale of the “Magician’s Sheep” mentioned in ISM as being part of the sheep herd being led to slaughter through hypnosis, then I cannot see any reason to look at society as an idol. It seems far more beneficial for those who truly are in the world but not of it to become open to the reality of the human condition itself described by Plato as if in a cave. What makes Simone so valuable as the “New Saint” is her valuation of the mind. It is what awakens a person to the conscious path of freedom from the Beast rather than the natural emotional inclination to become a greater part of it and acquiring the captive “feeling” of prestige from it. Alluding to the allegory of the cave in Plato’s Republic, where reality is seen second-hand as shadows on the wall rather than directly in the light of reality, Weil points to the compelling truth that everything people do or believe is based on a second-hand source: society. As long as individuals substitute society’s view of reality for their own discoveries of reality — so that the relationship to self, others, nature, and the universe is direct, immediate, intuitive, and accountable — the individual will remain oppressed. We have this modern trend to glorify the Beast without realizing we are just a mechanical conditioned part of it which continually changes by adapting to external conditions. “With others” must be considered in quotations. Does its value come from its being a part of the Beast or from a mutual understanding of being in the world but not of it? How many can really discriminate between the two? The city gives one the feeling of being at home. We must be rooted in the absence of a place.To uproot oneself socially and vegetatively. It is obvious that this authentic striving is rare but it is inspiring to know that there are and have been those like Simone and of course Mr. Gurdieff who were authentic seekers of truth needing to experience the Pearl of Great Price at the expense of the pleasantries acquired through personal and social justifications. I hate to think what the world would be like now and in the future without their efforts. Events happen. Deeds are done. There is no “doer” thereof. When clearly seen, the doors of perception are flung wide open. The Great Way is not difficult for those with no prefrences. Complete acceptance of everything, without preferences or rejection, I think this is what Merton aspired to at the end, after his trip to Asia. So do I. Not easy, not to have preferences. Find out for yourself who that one, the seeker really is. When that is discovered, the seeker and the seeking are finished. Thank you, Joseph. This is true (I think). Is there a distinction between acceptance and affirmation and is it valuable for those seeking truth to become aware of? I would say yes. I agree, Nick. There is a distinction between acceptance and affirmation, and it is very useful to know the difference. We are constantly affirming ourselves and what we know, in spite of all evidence to the contrary. This is where the problem of language comes in. For me, affirmation means conscious experience while acceptance implies its denial. For example the sheep in the Armenian parable Gurdjieff used in ISM to describe the human condition live in acceptance. It is the black sheep that begins to affirm the reality of its condition..
You’re right, Nick. It’s about language. For me, affirmation means affirming the self. Acceptence is active and conscious–and quite an attainment. I don’t think it is the same, Nick. Knowing means understanding, which means acceptance. Real acceptance is love…and understanding. The difference between self love and love of self. That’s a big question. Self love, our opinion of ourselves, is very attractive in comparison to love of self, a potential we are not.. This is one reason Alinsky dedicated his book “Rules for Radicals” to Lucifer who is known for the beauty of the light of self love. Self love (image) sells. Love of what we might become, love of our potential for liberation from ego…an idea worth entertaining. Tracy, one of the best books I ever red on Chritianity is Jacob Needleman’s: “Lost Christianity.” He explains the difference between Christian and secular love. I think you will appreciate it. I loved that book when I read it decades ago. I’ll look at it again. We’re going to run an inteview with Needleman in next issue of Parabola, the Unknown.